Solicit independent thoughts about the organization's major issues beforehand, getting individuals thinking about the future. Build trust and understanding by facilitating interactions between team members as they pool their collective insights to create a short, mutually understood, prioritized, and actionable list of the current issues. Build a shared visualization of the future they are all striving to reach. Create the framework that informs their daily focus and prioritization. Identify this year's focus on status quo changes that accelerate motion toward the shared visualization of the future. Interactively communicate this year's strategic plan, including a strategic planning tutorial, to the next level in the organization. Sustain commitment and implementation with at least one midcourse review meeting that refreshes this year's strategic plan. 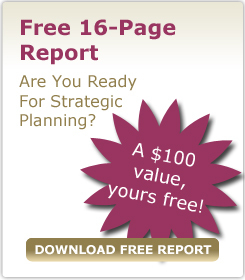 Does your organization want to maximize the value of its strategic planning investment? Do you have a 5- to 12-member Senior Team motivated and able to devote two intense days for the annual planning meeting? Are you able to commit the Senior Planning Team for at least one additional day during the planning year for a review meeting to account for progress, and refresh the plan? $11,900 fee*, plus expenses, for Myrna Associates that covers the use of our process, processing of pre-annual meeting input, facilitation of the two planning meetings, preparing the Microsoft Word and PowerPoint documentation, creating and shipping planning notebooks with CDs for the planning team, and emailing of midcourse revisions to the plan. Myrna Associates guarantees your complete satisfaction with a 100% money-back guarantee. To arrange for a complimentary consultation to determine if the program is right for you and you are right for the program, contact us or call us (800)207-8192. Either way -- good luck with your planning! Five years ago where did you think you'd be today? Where do you want to be five years from now? Columbus didn't reach the New World by standing on the stern of the Santa Maria and setting course from its wake. Unsure how TQP could work for you? Contact us for the names of CEOs who would be pleased to share their experiences with you. *Fee higher outside the Continental US, surcharges may apply for short notice or larger teams.